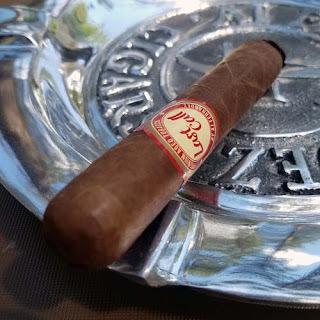 This National Brand Cuban Seed Toro Cigar looks like it could easily carry a $8.00 price tag, but in truth, it sells for just over 3 bucks as a single. Visually, this mixed filler cigar looks great. The Colorado Claro colored natural wrapper is silky smooth, seamless, oily and practically vein free. It's packed well from head to foot and it has a triple cap. Testing the very free and easy draw, there's a hint of toast, plus it leaves a sugary aftertaste on the lips. Once the cigar is burning the first mild/medium bodied flavors are a mix of oak and black pepper. As the sharp burn line moves through the first half there are other flavors of paper, cream and sugar. In the second half the strength moves into the medium range and there are notes of sweet caramel with black pepper. As the burn reached the band area, the flavor soured a bit and the black pepper increased to a point where the cigar wasn't fun to smoke any longer, even a quick purge didn't help. Overall this cigar was pretty good for a two dollar and change cigar. Neptune Cigar sells this National Brand Cuban Seed Toro in bundles of 25 for just $53.95. That's not a bad deal. The construction of this cigar was great, the flavors were good in the first 2/3 and it gave me forty-five minutes of smoking pleasure.